← Page 158/365 : I did it! Fargo has long been one of those film I have wanted to watch but never really had the chance to get around to. But I woke up early this morning and it was on Netflix so I decided to give it a whirl. Fargo tells the story of Jerry Lundegaard, played by William H Macy, who wants to swindle his own wife and father-in-law out of $1m by staging a Kidnapping. Unfortunately he hires inept kidnapping duo Carl (Steve Buscemi) and Gaear (Peter Stormare) to carry out the job and their bungling ways send everything the wrong way. Frances McDormand is the pregnant Officer Marge Gunderson who becomes dedicated to tracking down the crime from start to finish. The Coen Brothers have really out together a unique film here. It’s brilliance comes from the dark comedy seeping through William H Macy’s slimy car-salesman turned crook performance, and deep into Steve Buscemi’s script-powered delivery. Stormare’s crook downplays his part and is understated, whilst the greed and psychotic ways bubble away inside him, blowing up now and then with bloody results. McDormand is great as the sleepy-town officer investigating everything, albeit two steps behind, and her slow-ways fits in with the whole feel of the film. There may be murders going on, but there’s always time to discuss the weather, or postage stamps, and it’s down the the great writing of Ethan & Joel that this works. Dialogue-heavy but executed to perfection, Fargo is currently listed at #129 in IMDb’s top films, and I am glad I have finally watched it. 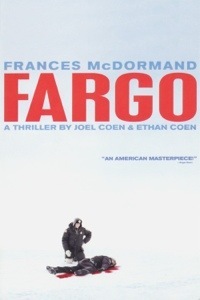 This entry was posted in 2013, 365, Movies and tagged Fargo, Frances McDormand, icheckmovies.com, Peter Stormare, Steve Buscemi, William H Macy. Bookmark the permalink.